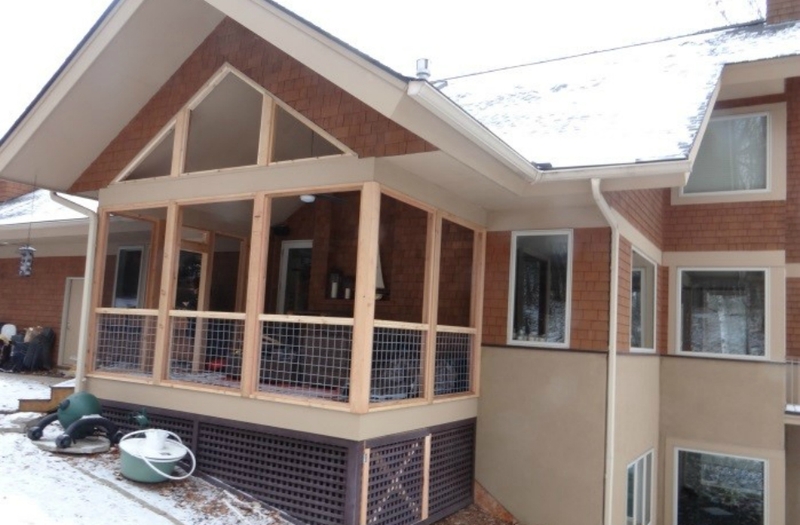 When our home owner from the Twin Cities decided to remodel their screen porch, we worked with the local Precision Decks porch builders to assure the finished project enhanced the look of their home. From past experience, we know that finish carpentry skills needed for a Weather Queen installation can be found wherever pride in craftsmanship and good business practices exist. 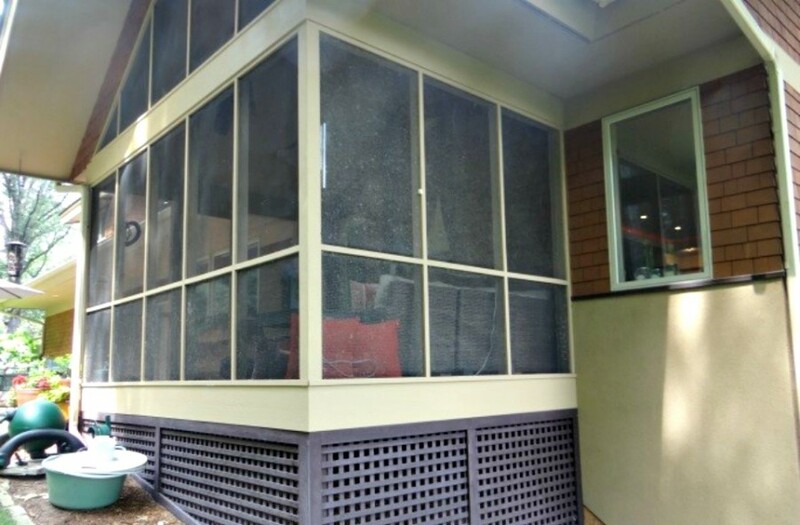 Screen porch prior to remodeling process. Prior to the remodeling process, the triangular area towards the top had screening installed. A Plexiglasin, the small opening above the screen door, was built. 6 x 6 posts were used to allow a larger opening. 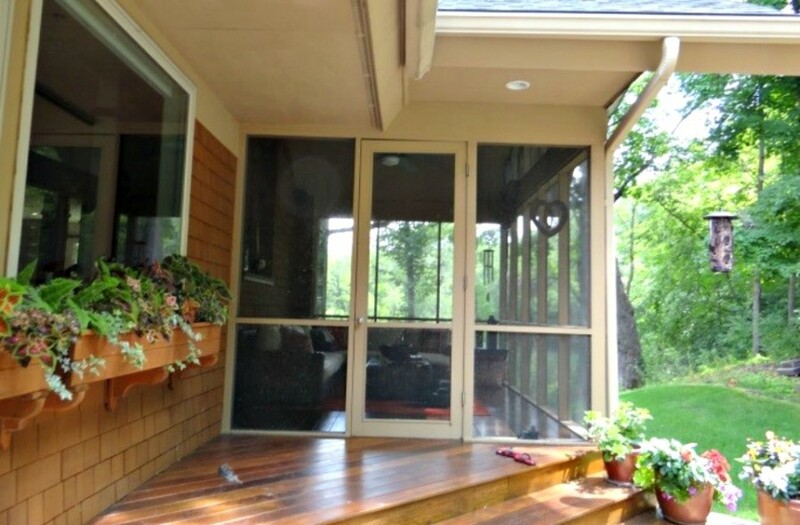 Precision Decks installed a new screen door and Plexiglasin–the small opening above the door. By also installing the Plexiglas in the triangle windows above the screened openings, light will always enter the porch, even when the shades are lowered. 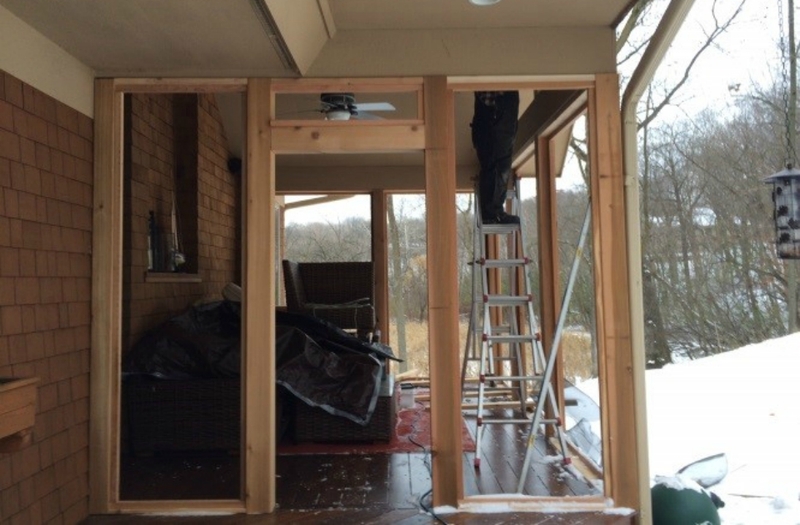 The 6 x 6 posts allow a larger opening, giving a feel of an additional living area to an already spacious home. Because of the screen porch location immediately off the kitchen, it oversees the gardens and play area for younger children, which adds to the flow of life at this home. Using Tresco Ginger Sunbrella® Awning and Marine Fabric, the Weather Queen Shades blend in perfectly with the home’s siding. 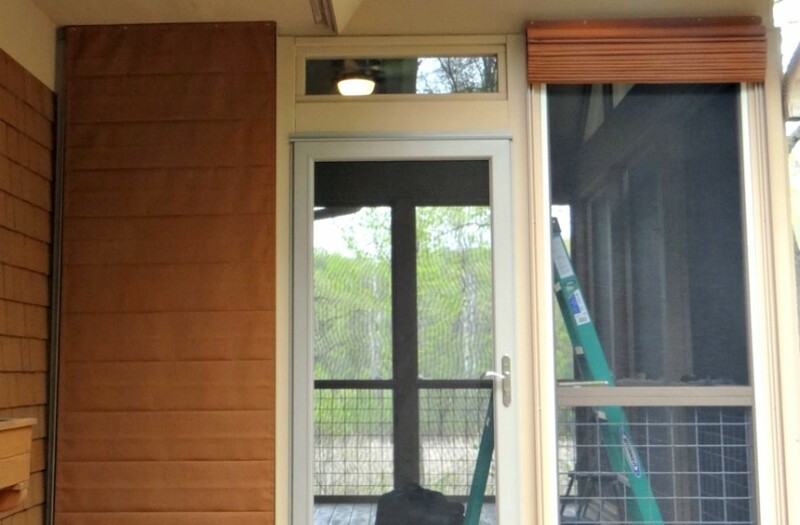 By installing Plexiglas in the triangle windows above the screened openings, light will always enter the porch, even when the Weather Queen Shades are lowered. 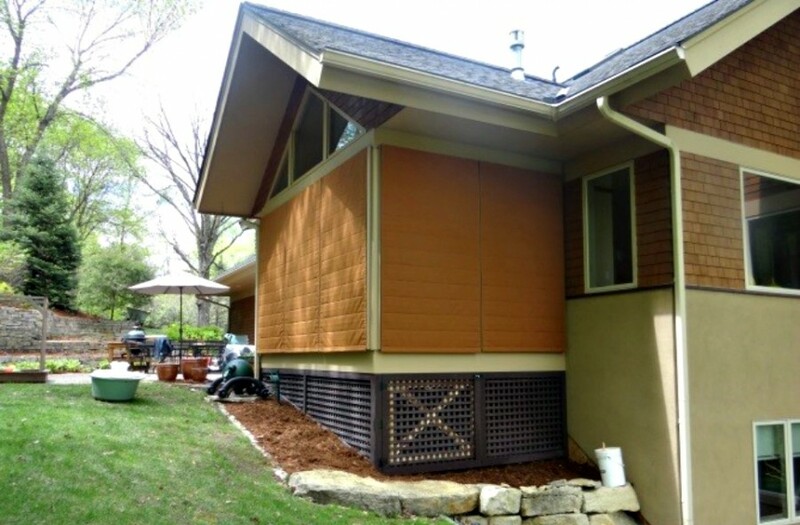 When lifted, Weather Queen Shades create a finished look on the home’s exterior. Weather Queen Shades are proud to be a high-quality foundation piece that opens many new possibilities for home time pleasures. 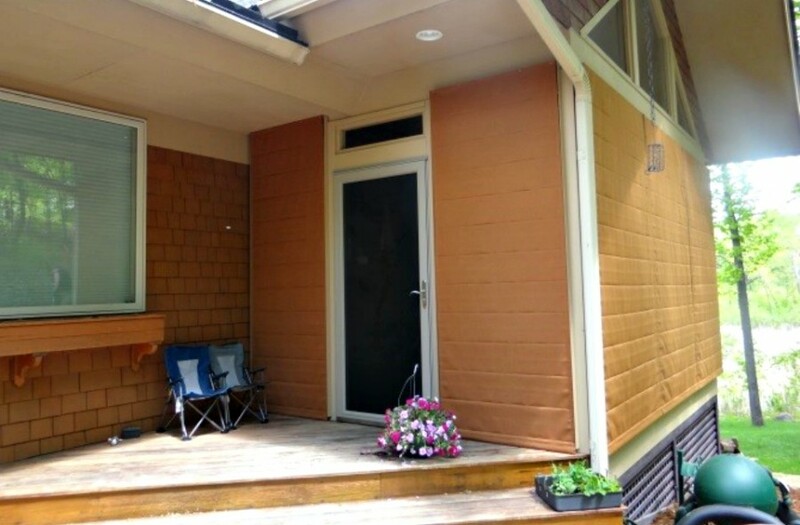 Our focus is on helping our homeowners retain the unique heart of a traditional screen porch, while minimizing the constant upkeep and adding value, livable space, and beauty to their homes. These are the qualities that beautifully crafted, custom window treatments have always given homeowners. Now, these qualities are not only for the interior of a home, but the exterior as well, encompassing function, form, and beauty.